Suitable for vegetarians. 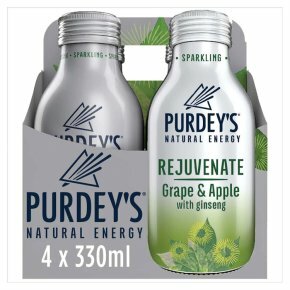 A blend of grape and apple juices, naturally boosted by botanicals and vitamins to give you a gentle lift. 1. Free from artificial flavourings, colours, preservatives and sweeteners 2. Free from caffeine 3. Vitamins C, B2, B3, B6, B12 contribute to the reduction of tiredness and fatigue 4. Vitamins B1, B2, B3 B6 and B12 contribute to normal energy-yielding metabolism 5. Vitamin C supports normal function of the immune system 6. One of your 5 a day (or night) 7. All protected with brown glass of a silver wrap so no light can diminish its potency.